In the balmy November sun, a girl pauses in-front of Kevin Bubriski’s photograph of a Mithila pillar from Suga Village, Mohatari, and recounts its ubiquity in her village to her friend. 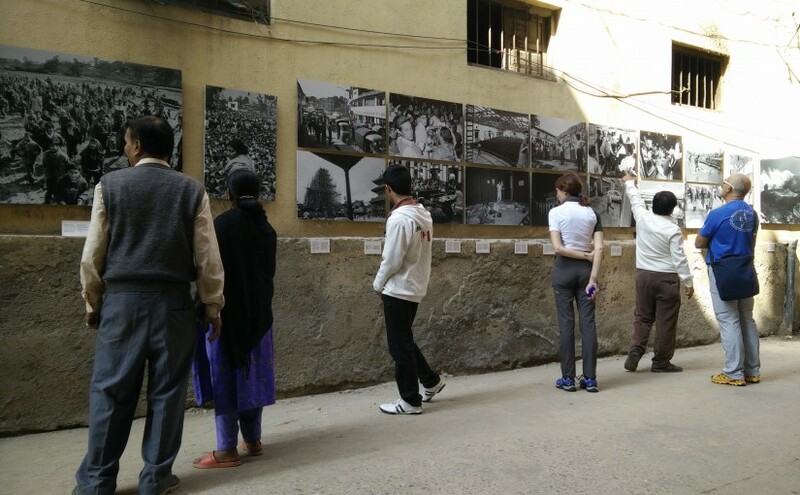 A man rushing past the east-Dhaugal wall joins a flurry of people looking at photojournalist Bikas Rauniar’s exhibition. These men, women and youths reflect on things that have changed and have remained the same since the nineties. In a subtle way, they look very much like the group of elated and astounded locals welcoming the hot-air balloon in one of Rauniar’s photographs. An elementary school girl, probably 12 or 13 years old, quizzically observes Frederic Lecleux’s work. ‘He seems to be photographing the simple everyday things’, she says. But young and naïve, she still has time to learn that photographs often defy the basic iconic indexicality, and aims to record much more – feelings, emotions and intangibilities. They don’t have to deal with the exotic, the historic, the important and the special, as most of us might presume. In Nagbahal, old men sit under a tree in the courtyard like they usually do. But this time they are accompanied by sets of archival photographs hanging from the branches. They look for families, relatives and friends, and point the houses of the people they spot. In the process, they also provide curatorial advice. ‘The frames have to be at eye level, but these are hanging too low’, says one of them. ‘The picture should have been bigger’, says another. Walking around the exhibitions, art-enthusiasts, shoppers, students, amblers, rovers and non-gallery crowd engage with each work – admiring them, critiquing them and questioning them. This completes the purpose of these photographs, giving them a diverse audience and creating a much-needed conversation and dialogue around them.